Six years ago, Sister Rosann Ocken, OSB, struggled with what the spirit might have in mind for her community. 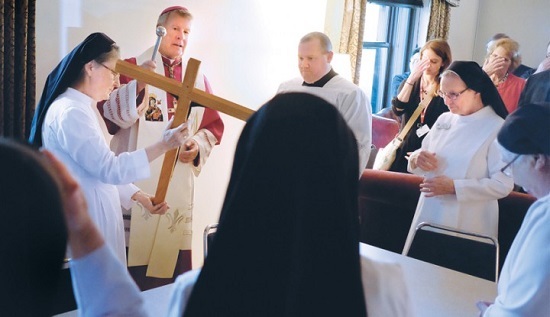 “We were transitioning out of health care, but unsure what the future held,” said the prioress of the Missionary Benedictine Sisters of Norfolk, Neb. An invitation by Bishop Walker Nickless to establish a presence in Sioux City answered that question. The international order of Missionary Benedictines has mission sites around the world, yet in the United States, their presence has been focused in Norfolk and a convent in Winnebago, Neb. On Aug. 15, a new religious house was blessed in the former rectory at St. Michael Church – Holy Cross Parish in Sioux City for four Missionary Benedictine Sisters, along with two Vietnamese sisters of the Congregation of the Lover of the Holy Cross. In his homily the bishop referenced the reading from the letter to the Hebrews, which addressed the concept of mutual love and hospitality to others. “May we see the work of these sisters build up the kingdom of God in this parish,” he said. With hands outstretched, the bishop continued with the prayer of blessing. “O God, inspirer and author of every holy resolve, hear our prayer that you will bestow the kindness of your grace on the religious who live in this house. Grant that those who here loyally follow Christ may together become an eloquent witness of their consecration to you,” he prayed. After the prayer of blessing, Bishop Nickless walked through the building sprinkling those present and the new religious house with holy water. “We have full faith and confidence that we are doing God’s will here,” she said. “I am confident they will be a powerhouse of prayer and Christian example for our parish,” he added. While their ministry will be parish-based at first at Holy Cross, Bishop Nickless noted, the sisters are considering expanding to other city parishes in the future. “The diocese is going to collaborate with Briar Cliff University to help the Vietnamese sisters work towards bachelors’ degrees, while they minister to the Vietnamese community at Cathedral Parish in Sioux City,” he said. Sister Pia Portmann, OSB, former prioress of the Norfolk Benedictine Monastery, who now resides in Sioux City, welcomed this new opportunity. Sister Gabrielle Marie Oestreich, OSB, superior of the Sioux City religious house, expressed her hope for the future. “The Holy Spirit opened the door for us here, so we are excited to be of service to Holy Cross Parish,” she said.